I have many devices using USB Port for charging. For this, I purchased one USB Hub to connect 4 devices at a time. But the result was disappointing . The devices are not charging and even a Pen drive is not opening in the Hub. Analyzed the reason and found that the USB port of Laptop is not giving sufficient current to the devices for charging. The USB.2.0 Port can give maximum 200 mA current and USB.3.0 can give maximum 400 mA current. Then how all these 4 devices in the Hub charge normally. The 200 mA current from the Laptop port is sharing to all devices, so no one is charging. Moreover, the Laptop gave a warning that, “USB Port over loaded and shutting down”. Remembered that famous saying “Every problem born with its own solution”. Got the remedy. If the current to the USB Hub is increased, all devices will charge normally. But in that case, Laptop is not useful and I have to make a separate power supply. So made a USB Wall socket. It has an AC socket for charging Laptop, and a 5V, 1 Amps SMPS power supply to power the USB hub. Thus the problem solved. 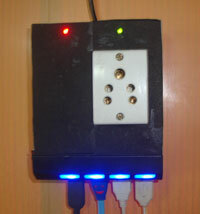 The USB Wall socket is fixed on the wall and powered from Mains. SMPS has well AC-DC isolation, so no shock hazard while charging the USB devices. I found the same type of USB Wall socket in the Online shop but its cost is Rs.2500. I made it at the cost of Rs.250. Let us check it.